Cardone Industries Inc. will construct a major distribution center near their current facility here in Harlingen Industrial Park. 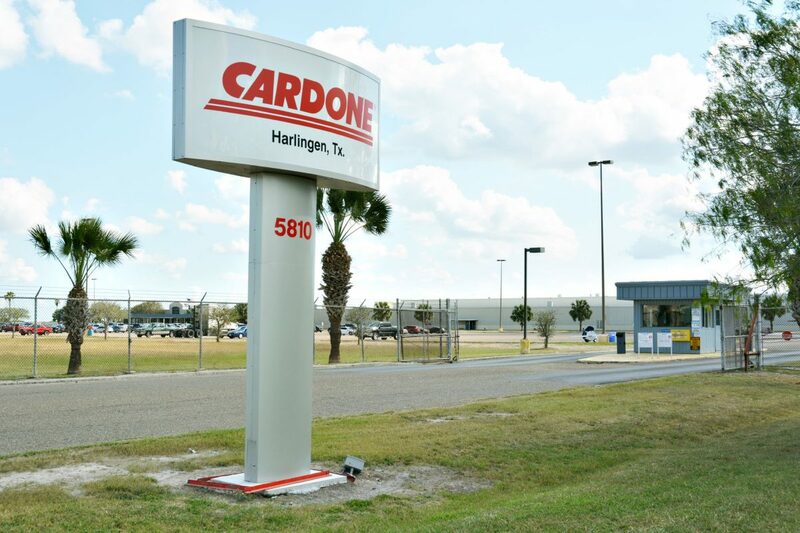 HARLINGEN — The City of Harlingen and Cardone Industries Inc. announced yesterday the company will construct a major new distribution center in the city’s industrial park. The state-of-the-art facility for the company, which primarily remanufactures aftermarket automotive parts, will be the largest industrial project to break ground in Harlingen history. Construction will begin near the current Cardone (pronounced car-DOAN) facility after a groundbreaking ceremony Monday at the site at 815 FM 509. The new facility should be completed by December 2018. The new distribution center is intended to support growing production at the company’s manufacturing facilities, one of which is located just across the U.S.-Mexico border in Matamoros, and will be constructed with the capacity for future expansion as needed. The number of jobs to be created in the first year will be 515, said Raudel Garza, chief executive of the Harlingen Economic Development Corp., which was instrumental in negotiating the deal with Cardone over the past two years. The pay structure for those jobs, Garza said, is still to be determined. “It will be a big payroll, obviously, we’re talking about $12 to $14 million in annual payroll,” he said. The building itself will be one of the largest anywhere in South Texas at 900,000 square feet. The current Cardone facility in the industrial park lays down a footprint of 650,000 square feet. “It’s a big building, and obviously will take a lot of people and equipment to build it,” Garza said. Since it’s founding in 1970, Cardone has grown into the largest privately-held automotive parts remanufacturer in the world. Cardone employs over 5,000 workers at facilities in Pennsylvania, California, Texas, Mexico and Canada. Cardone also added operations in Vancouver, Phoenix, Seattle, Toronto, Spain and China through its acquisition of ADP Distributors and Rotomaster last month. Cardone is perhaps best known outside the manufacturing sphere for its prominent mention in the 2016 presidential primary campaign. In early January of that year, the company announced it was laying off 1,300 workers in Philadelphia and moving its brakes division to its plant in Matamoros. By the end of the month, Trump had hit a new high in polls in the race for the GOP nomination, with support from 41 percent of Republicans surveyed in a CNN/ORC poll. Groundbreaking ceremony for the distribution center on will be held Monday at 9 a.m. at the Harlingen Industrial Park, 815 FM 509. The process of remanufacturing involves restoring used parts like anti-lock braking systems, electronic transmission modules, accelerator pedal systems and other complex automotive parts with new components to meet manufacturer’s specifications. Unlike rebuilt parts, remanufactured equipment usually carries longer and stronger warranties when used as a replacement for a vehicle’s original equipment. Anti-lock braking systems, accelerator pedal sensors, diesel particulate filters, electronic automatic transmission modules, electronic brake assemblies, electronic power steering products, electronic throttle body assemblies, glow plug controllers, hybrid batteries, totally integrated power modules, auxiliary coolant pumps, and turbochargers/superchargers, as well as remanufactured totally integrated power modules, air suspensions, and accelerator pedal sensors. New parts manufactured by Cardone are sold under the Cardone Select label.